The Republic of Kiribati, a small island state of about 110,000 people, spread across a vast marine territory in the Pacific the size of the Unites States, has joined the Pacific wave for One Laptop per Child. "We believe OLPC has great potential to improve the quality of our basic education," said Kiribati Minister for Education, Hon. Toakai Koririntetaake, this week in a prepared statement. The Minister said Kiribati would deploy OLPC "to improve our national standards in literacy and numeracy, to teach our children new lifelong skills, and boost the long-term economic development of our country." Kiribati, one of the world's poorest nations, faces severe challenges in population growth, health and sanitation, and climate change, and has embraced OLPC as a catalyst to breaking the cycle of poverty. 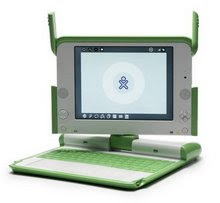 The MOE has appointed a senior level OLPC Country Working Committee to oversee the distribution of 2000 XO laptops in primary schools in 2011 and to address key issues such as curriculum integration and teacher training. Kiribati will measure OLPC's impact on basic literacy and numeracy, in line with the AusAID-funded Kiribati Education Improvement Plan (KEIP). In Kiribati, at the class four level in English literacy-43% of children show little or no evidence of achieving the learning outcomes appropriate for that level. For indigenous Kiribati literacy and numeracy, the figures are 25% and 53%, respectively. Read the full Ministerial Statement here.